Cherry trees are a valuable addition to any landscape. Their rounded, open shape, lovely spring blossoms and smooth, glossy bark are easily recognizable. 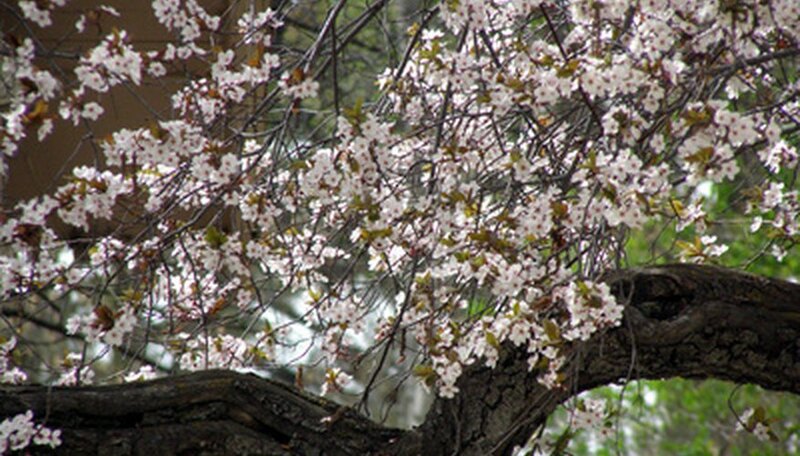 Cherry trees tolerate a range of soil conditions, making them an ideal street tree. Ornamental cherry trees line the streets of many U.S. cities, including Washington, D.C., for this reason. Annual cherry blossom festivals throughout the United States herald this spectacular tree. Hundreds of varieties of cherry trees exist, including sweet cherries for fresh eating and sour cherries for making pies and jellies. Standard cherry trees range in size from 15 feet high for sour cherries to 25 feet high for sweet cherries. Dwarf cherry trees are now available, as well as bush varieties that resemble large shrubs. Additionally, flowering ornamental cherry trees produce lovely pink flowers in the spring, but don't produce fruit. These trees are grown throughout the United States. Weeping cherry trees have a weeping habit and trailing branches. The leaves of cherry trees are light to dark green and emerge mid-spring, often appearing red initially. They grow alternately on the stem and are an elongated oval shape with pointed tips. The edges of the leaves are finely serrated. Cherry trees produce white to pink blossoms in early spring and fruit in June or July. The bark of cherry trees is reddish brown and finely textured with rows of horizontal markings. Sour cherry trees are prized for their sour "pie cherries." A typical standard sour cherry tree produces as much as 2 1/2 bushels of fruit. Sweet cherry trees produce around 3 bushels of sweet, juicy fruit per tree. Non-fruit bearing cherry trees are used as ornamental trees in landscapes, parks and cityscapes. They tolerate pollution and drought and often are used along streets. Ornamental cherry trees require the least care, needing only an occasional watering and spring pruning to remove dead and diseased limbs. Fruit bearing sour and sweet cherries need regular irrigation at flowering and fruiting times and an annual top dressing of manure. They need minimal pruning in the spring to create an open canopy. Cherries are among the first trees to blossom in the spring and often are damaged by late spring frosts. Sweet cherries especially are vulnerable to frost-kill and are best grown in mild climates. Sweet cherries aren't self-pollinating and need another variety nearby for pollination. Not to be confused with cherry trees, the purpleleaf sand cherry is an ornamental shrub or small tree that has reddish-purple foliage and small, insignificant fruits. It is a member of the rose family and an entirely different plant than cherry trees.